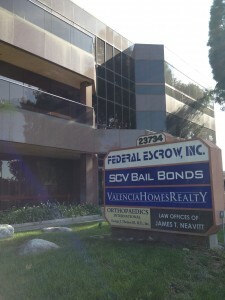 At SCV Bail Bonds (Santa Clarita Valley Bail Bonds), we strive to offer caring, expert service to our local community members by being able to consistently provide 24 hour, local bondsmen and fast, professional support to those in need. Our local SCV office is also our headquarters, located directly across the street from the Santa Clarita Sheriff’s Station Jail, just a quick walk from the station doors! We offer clients and families a comfortable place to handle the paperwork, appointed with plush seating, current reading materials and hot coffee, snacks and refreshments, while they wait for their loved ones release. This, versus waiting long, arduous hours in a sheriff’s station lobby chair. The city of Santa Clarita is serviced by Interstate 5 directly on the western side of Santa Clarita. The east side of the City is serviced by State Route 14. State Route 126 terminates at Interstate 5, goes west to Ventura, and passes directly through Fillmore and Santa Paula. We offer creative and flexible payment plans to meet every budget and will always focus on what you and your families’ needs are, first. See why choosing the right bail agency in Santa Clarita Valley, can make all the difference to you. We’re proud members of the Santa Clarita Valley Chamber of Commerce and Accredited Members of the Better Business Bureau and the California Bail Agent’s Association.